Diving the south of Sulawesi near the island Selayar. It is difficult to divide the sea around Selayar into single dive sites as the whole coast can be considered as one huge dive site. 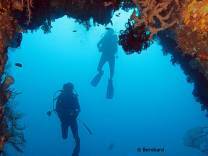 The reefs that surround the east side of Selayar are mostly steep walls that are full of overhangs and small caves. Slopes and an underwater mountain are not far from the resort. Even before the naval marine park was founded, the unique richness of the fish in Selayar was extraordinary. Since the reefs were put under protection in 2000, there has been breathtaking growth of corals. 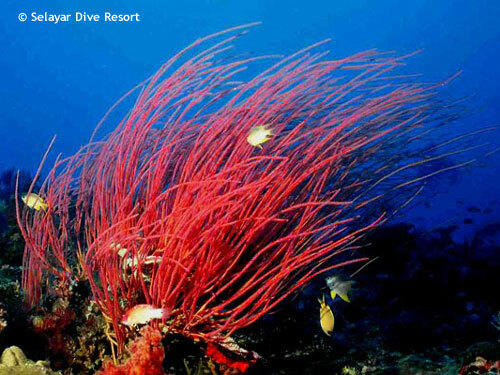 Soft corals growing on the steep walls and hard corals at the reef top impress every diver. The Indo-Pacific is known as the world's ocean which is richest in species. And at Selayar there is the chance to see everything that the tropical underwater world has to offer – from pygmy seahorses to hammerheads.